This is a slightly unusual, but extremely tasty chutney. It breaks the monotony of having the usual coconut/tomato/onion chutneys with South indian breakfast mains like idly, dosa, upma etc. 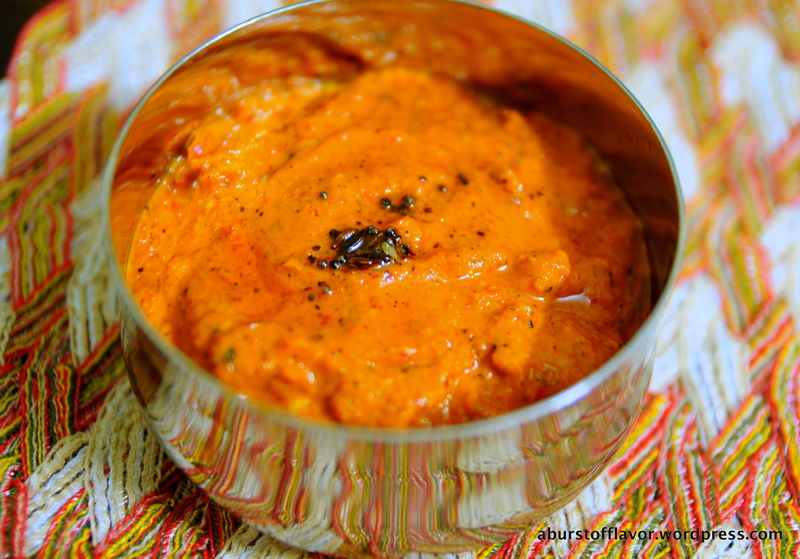 This chutney is delicious and versatile in that it has a variety of uses. Add some cream, oregano, pepper and use it as a pasta sauce, or use it as a spread for grilled cheese sandwiches. Either way, it is yummy and different. Red bell pepper/capsicum – 2 nos. Chop the bell pepper and the onions into cubes. No need to be thorough as we are going to grind it later. Heat oil in a pan of your choice. Add the garlic and sauté quickly just for 2-3 seconds until the raw smell is gone – take care not to burn the garlic. Add the red chillies and sauté quickly for a few seconds. Add the chopped onions and bell pepper. Now fry this mixture for about 2-3 minutes on a medium-high flame until the capsicum and onions are soft. They need to be soft but firm to the bite. Do not add any water during the process. Cool this mixture down to room temperature. Pulse this mixture in a blender or mixer after adding salt. Add little or no water based on what consistency you prefer your chutney to be. Transfer the chutney to a serving bowl. Adjust salt if required. Heat some oil in a small pan and add the items under the ‘to temper’ list. Add the hot tempering to the chutney and mix well. Serve with breakfast/dinner mains or skip the tempering and get creative with this chutney 🙂 !